A darkly comic short story about the unintended consequences unleashed by our quest to tame the natural world. Fox 8 has always been known as the daydreamer in his pack until he develops a unique skill: he teaches himself to speak “Yuman.” The power of language fuels his abundant curiosity about people—even after “danjer” arrives in the form of a new shopping mall that cuts off his food supply, sending Fox 8 on a harrowing quest to help save his pack. 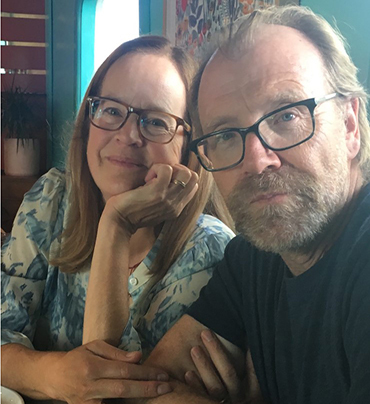 Told with his distinctive blend of humor and pathos, Fox 8 showcases the extraordinary imaginative talents of George Saunders, whom the New York Times called “the writer for our time.”. Set in a circa-1960s rural South Dakota, the book portrays a loving but struggling young family in turmoil, and two siblings, Rene and Leon, who opt for different but equally extreme means of escaping the burdens of home. By turns funny and tragic, lyrical and terse, Paula examines the classic American question: What is to be vulnerable in a culture of striving and power and what are the effects on both those who dominate and those who are overrun? George Saunders is the winner of the 2017 Man Booker prize with his first novel, a New York Times #1 Bestseller, Lincoln in the Bardo. He is also the author of nine books, including the New York Times bestsellers Congratulations, by the way and Tenth of December, an essay collection which was a finalist for the National Book Award and won the inaugural Folio Prize. He has received MacArthur and Guggenheim fellowships and the PEN/Malamud Prize for excellence in the short story, and was recently elected to the American Academy of Arts and Sciences. In 2013, he was named one of the world’s 100 most influential people by Time magazine. He teaches in the Creative Writing Program at Syracuse University. Paula Saunders grew up in Rapid City, South Dakota. She is a graduate of the Syracuse University creative writing program, and was awarded a postgraduate Albert Schweitzer Fellowship in the Humanities at the State University of New York at Albany, where she spent two years studying under then-Schweitzer Chair,Toni Morrison. George and she have two grown daughters.